Alpine Auto Electric was established in 1999. The founder and current owner has been in the starting and charging system business since 1984. Owner, Clark Gordon has several years of rebuilding experience. 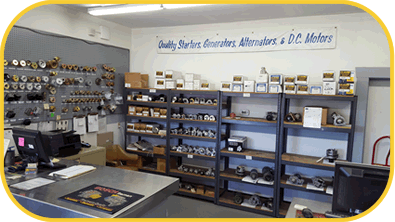 Before opening Alpine Auto Electric, Clark worked 11 years in the starting and charging parts distribution business. Clark was very active in assisting customers with technical advice on building starters, alternators and DC generators. Prior to the distribution experience, Clark was rebuilding units for Master Rebuilders in Paoli, WI. Clark got his feet wet and gained a wealth of experience and expertise working for Master Rebuilders. Alpine Auto Electric is based in the heart of Green County Wisconsin. Our area is filled with Dairy and Crop industry. Alpine Auto Electric is a small three man shop. Unlike the Big shops, we can keep focused on the job with a personal one on one communication with our customers. Alpine Auto Electric is a member of the ERA as well as the APRA. Both of these associations, help Alpine Auto Electric keep up to date with changes and technical information for the Starting and Charging industry. “we keep current”. Alpine Auto Electric ships UPS. We can ship up till 4:00 PM Central time. We accept Visa, Master Card and Discover Cards. Alpine Auto Electric is open Monday thru Friday 8-5. Saturdays, by appointment. Toll free 866-338-4423.